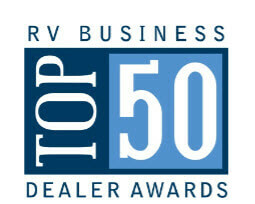 RVBusiness magazine recently named local dealership Wilkins RV, located in Bath and Churchville/Rochester, NY, as one of its 2016 Top 50 RV Dealers in North America. This is an honor Wilkins RV is proud to have received the past three years. This prestigious award is determined by RV dealers’ business aspects including customer service and satisfaction, employee training, financial planning, marketing and community involvement. Recreation vehicle manufacturers nominate dealers across the United States and Canada who exemplify best practices and excellence in their field. Wilkins RV is one of only 50 RV dealers to be selected by an independent panel of industry experts to meet the highest criteria of sales practice and service. This year was an exceptional achievement due to the amount of entries and detail of applications from participating RV dealers. The 2016 class of RVBusiness Top 50 dealers were honored at a Nov. 9 awards reception in front of an all-industry audience of about 400 during the 2016 RV Dealers Association (RVDA) International Convention/Expo at Bally’s Las Vegas. Here at Wilkins RV, we would like to thank our customers for continued support and loyalty. We can’t do what we do without you!